The first English rhubarb is now coming into the shops and perhaps some of you will be having it in your garden before long. 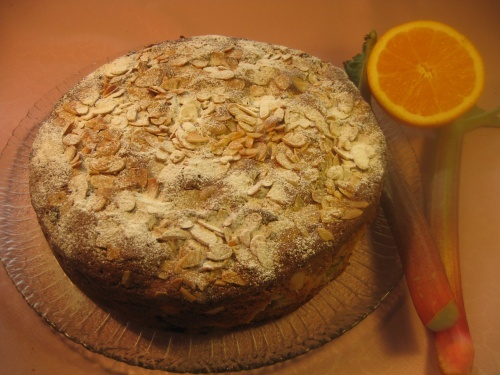 Orange goes so well with rhubarb and the ground almonds help to make a firm cake absorbing any rhubarb juice. Have it as a pudding with single cream or as a cake at any time. You will need a 23cm / 9in loose base round shallow cake tin. I used a springform tin. Wash the rhubarb and cut it into ¾in (15cm) slices. Put it into a bowl and stir in 50g (2oz) of the sugar. Leave on one side for 30mins. Grease and line the base and sides of the tin with baking parchment. Heat the oven to gas 4/ 180C / 160C fan. Put the remaining sugar (8oz) into a bowl with the softened butter and grated orange rind and juice beat well. Gradually beat in the egg and then add the flour, baking powder and ground almonds then beat again until smooth. Fold in the rhubarb with any juices. Spoon into the tin and smooth the top. Sprinkle with the flaked almonds and bake in the centre of the oven for 1-1hr 15mins until golden and firm in the centre. Cover with foil if it seems to be getting brown. Leave it in the tin for at least 15mins before removing from the tin and leave on a wire rack to cool. Dredge with icing sugar before serving.